The book launch for Huncke is scheduled July 8 at the Nightingale Lounge in New York City (213 2nd Ave) at 6:00 p.m.
George Witte, a New Jersey poet whose collections include The Apparitioners and Deniability (above), will host the launch. 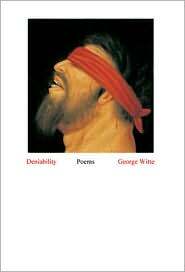 George, who is also the editor of St. Martin’s Press in New York, writes poetry that appeals to me in its deft deployment of meter—he is a tremendous blank verse poet—and in its direct evocation of rampant anxieties that flow just below the surface in our day to day lives. He fleshes out the New York area suburban existence as only a longtime-railroad-commuting poet could. In fact, he does much of his writing on his commute to the city. I hope you’ll be able to join us. The doors open at 6:00 p.m. and we can stay all night if we want to. I will read from Huncke, of course, and illustrator Paul Weingarten will be on hand to sign books. There is a $10 minimum at the bar, which gets us into a wonderful club with one of the best stages for poetry anywhere in New York. This entry was posted on June 16, 2010 at 1:28 pm and is filed under Uncategorized. You can follow any responses to this entry through the RSS 2.0 feed. You can leave a response, or trackback from your own site.